Ford's B-Max is new to the mini-MPV market but goes straight to the top of the class with a trio of new technologies that put its mostly dull rivals in the shade. The most obvious of these is a radical new body structure. The B-Max is the first car of its type to do without what car industry types call a B-pillar – that's the central pillar between a car's front and rear passenger compartments, the one to which the rear doors are usually attached. The huge opening that results makes it much easier for passengers to get in and out and it's handy for loading up those big, awkwardly-shaped flat-packs on trips to Ikea too. The rear doors are sliders, so you won't be nudging other cars' doors in tight parking spaces either. It's a great idea, so why has nobody done it before? Well opening up such a big hole in the side of a car would normally make it go all floppy but Ford has compensated for that by strengthening the rest of the car's structure and building what amounts to a virtual B-pillar into the back edges of the front doors and the front edges of the rear sliding doors. 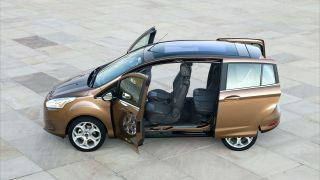 Once closed, so-called "crash catchers" lock the doors into the roof and floor structures and Ford is confident that the B-Max is strong enough to get a five-star top score in the Euro-NCAP crash tests. Ford SYNC is the brand's voice-driven in-car connectivity technology. Developed with partners Microsoft and Nuance Communications, SYNC makes it easier for drivers to use devices connected via Bluetooth or USB to make phone calls or play their music collections. Don't worry if you haven't got a fancy iPhone or the latest Android handset – SYNC isn't a brand snob and will hook up to just about anything. Phone-wise, once a Bluetooth connection is established, SYNC transfers your contacts so that they come up on the B-Max's small dash-top screen but it asks permission first. Once that's done, you can initiate calls via voice commands by giving the name of the person you want to contact. SYNC can also read your text messages, which is a lot easier and safer than fumbling illegally with your handset at the wheel. It can even decipher emoticons and reads them out in full – "smiley laughing", for example. You can reply using a variety of pre-cooked messages – e.g "call back in twenty minutes"
Music files can be called up by voice from your music player by track title or artist name but this needs to be connected by USB cable to make full use of SYNC's features. SYNC will stream content – including Internet radio stations - via Bluetooth from a smartphone as well, but in this case it has to be controlled from the phone itself rather than via voice command. SYNC also gives you an Emergency Assistance option that connects to local emergency services in the event of an accident. One grumble - SYNC first popped up in the US on the 2008 Focus and most Fords sold in North America now have it, so why has it taken so long to get it into European cars? Blame the huge amount of work involved in getting advanced voice recognition technology to handle Europe's dozens of languages and accents. Now SYNC is here, though, Ford is rolling it out as quickly as it can, with the sporty Focus ST and the new Transit Custom van among the first to benefit. SYNC is great but it doesn't give you much to show off to your friends. There's no big high-res touch-screen colour display, no fancy buttons that delight to the touch –just that small readout which shows the bare essentials. But that's the point really – you don't need any of the eye candy if you mainly interact with the car by talking to it. The third piece of B-Max top tech can be found under its bonnet in the form of Ford's brilliant new 125 horsepower three-cylinder 1.0-litre EcoBoost petrol engine, which first appeared earlier this year in the Focus. Ford usually compares the 1.0 EcoBoost with a normally-aspirated engine of 1.6 litres but it's better than that. It works smoothly and cleanly, and while it feels slightly soft at the bottom end, it pulls hard once it gets into its stride. Best of all – it sounds great. Three-cylinder engines have a distinctive throbby beat and it's there in the B-Max, but it sounds more refined and much more grown up than most other threes. Like all modern Fords, the B-Max has excellent ride and handling, although it leans a bit more than a Fiesta. One oddity – in the B-Max, the 1.0 EcoBoost only gets a five-speed gearbox instead of the six-speeder in the Focus. It works fine but hints that Ford may have had to cut a few small corners to get a car with this much technology on to the road without charging too much money. Prices start at £12,995 but that's for the stripped out Studio model that does without air-con and alloy wheels. All B-Maxes get the practical pillarless body, but you're looking at more than £18,000 if you want one with SYNC, the 1.0 EcoBoost, and decent trim.